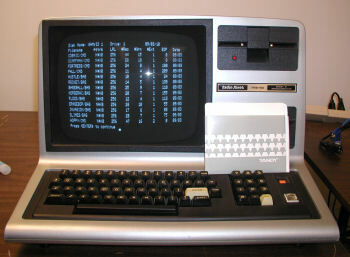 The Commodore P-500 was the first to have a SID chip installed. The boot screen from a PAL Commodore P500 using an NTSC monitor. I have to use a step up/step down transformer because this is a 220 / PAL system. After carefully testing the AC input and DC power output I determined that the power supply was correctly sending 12V, -12V, 2.5V, and 5V. There is a TIP29 transistor that seemed to be sending the correct voltages, based on the data sheet. I swapped the English PAL VIC-II chip with a VIC-II from a C-64. The black and white screen above is exactly what you'd expect to see coming from an NTSC monitor when receiving the PAL refresh rate. "...This is a relatively simple change. ...To go from PAL to NTSC you need to swap the MOS 6569 for a 6567, close LK5, open LK4, and swap the crystal at Y1 for the 14.31818MHz one. Lastly make the color adjustment with the small trimmer until you get good color. Make the adjusments VERY SLOWLY with a non-metallic tool. .."
Next: Replace the crystal next to the 6551 chip from the PAL to NTSC version. First swap the PAL VIC-II chip for the NTSC version (MOS 6569 for a 6567). The VIC-II chip is the one with the heatsink compound on the id plate. Click Image for detail view. Last, change the jumper from LK4 to LK5. The Commodore P500 pictured here still uses 220V (English) current and the UART is still European, but the video has been successfully converted to NTSC. If the the picture needs adjustment carefully turn the potentiometer near U21 to fine tune the video. There is another pot nearby, not sure what it does.